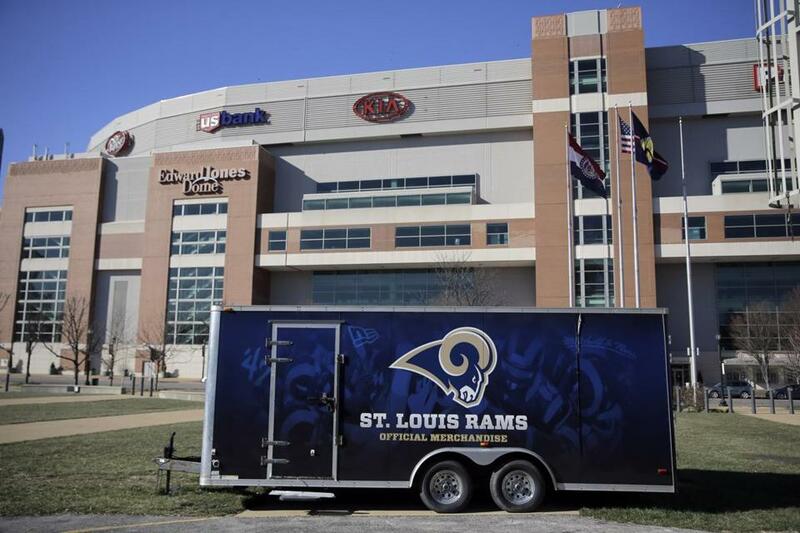 Instead of merchandise trailers, there soon will be moving vans lining up outside the Edward Jones Dome in St. Louis. The sting still hadn’t worn off Wednesday morning. The city of St. Louis had just lost the Rams back to Los Angeles some 14 hours earlier, and the wound was still fresh. It’s OK, St. Louis. Take a little time to mourn the loss of your 21-year-old Rams. But in the end, the NFL probably did you a favor. St. Louis and Missouri leaders fought hard to keep the Rams. Of the three cities vying to keep their teams away from Los Angeles — along with San Diego and Oakland — St. Louis was the closest to actually coming up with a plan for a publicly funded stadium. A Missouri state task force recently approved a $1.1 billion stadium plan north of downtown St. Louis that asked for $300 million from the NFL, $250 million from the Rams, $150 million from St. Louis, and the state contributing the rest, about $400 million. The Chargers have squabbled with the city of San Diego for more than a decade about getting public money for a stadium, but the city has a proposal that could be voted upon this summer if the Chargers opt not to join the Rams in Los Angeles. The city of Oakland has never submitted a formal stadium proposal. But in an interesting twist, the NFL and Rams owner Stan Kroenke both said “no” to the public money and instead opted for Kroenke’s massive Los Angeles project, which will be funded entirely with Kroenke’s deep pockets. Kroenke’s net worth is estimated at $6.3 billion, and his wife, Ann Walton Kroenke (of the Wal-Mart family), is worth $4.9 billion. The NFL always maintained that it gave first preference to the home market to keep its team, but it turned out to be lip service in this case. “We’d aim for a target, hit it, and they’d say, no the target was over here,” Dave Peacock, chairman of Missouri’s stadium task force, told the St. Louis Post-Dispatch. Kroenke was hell-bent on bringing his Rams back to Los Angeles, and doing it his way. He bought land in Inglewood two years ago at the old Hollywood Park, and blew away the other 31 NFL owners Tuesday with a stadium/retail/NFL Amusement Park presentation that could cost upward of $3 billion and will be “one of the greatest sports complexes in the world,” according to NFL commissioner Roger Goodell. Almost all sports teams put their hands out for public money when it’s time to renovate or build a stadium, but the NFL has opted for private funding for some of its biggest projects: Gillette Stadium in Foxborough 14 years ago, MetLife Stadium in East Rutherford, N.J., and now Kroenke’s stadium in Los Angeles. “It’s a risk that [Kroenke] can absorb,” said Smith College economics professor Andrew Zimbalist, who has written several books about the economic impact of stadiums and sports. “NFL teams make a lot of money, and he’s going to have the Taj Mahal of NFL stadiums. So, civic leaders in Missouri return to their constituencies today empty-handed, known as the politicians who lost the NFL again. It’s probably not something they want on their political epitaph, but there is a bright side: Kroenke spurning their stadium project means the city and state now save upward of $550 million in public funding that can be used for something other than lining an NFL team’s pockets. There is debt service to be paid when cities and states borrow money to build lavish sports palaces. That’s $20 million-$40 million a year that now can theoretically be used on roads and parks and schools and actual public services in Missouri. St. Louis is a strong, proud sports town, but its emotional connection is with the Cardinals, their crown-jewel baseball franchise. The city’s relationship with professional football has always been a bit tepid. They lost the Cardinals to Phoenix in 1988, and only persuaded the Rams to come to town with a sweetheart lease deal with the Edward Jones Dome in 1995. The contract required the stadium to be operated at a “first-class standard,” and the city had to pay for renovations to ensure that the dome remain in the top 25 percent of all NFL stadiums every 10 years, an impossible standard to live up to. Now 20 years old, the dome is old and far below NFL standards as far as amenities and luxury suites. The Rams recommended more than $700 million in renovations, and the city and state countered with the $1.1 billion public/private stadium proposal that the NFL turned down. The Rams aren’t exactly a cultural institution in St. Louis. They had the league’s lowest attendance this season (52,402) and lowest percentage of the stadium filled on game days (80.2 percent). Obviously, the threat of losing the team to Los Angeles affected those numbers. But in the last six years, the Rams have never been higher than 27th in percentage of capacity, and never filled more than 87 percent of the stadium in a season. The Rams treated their customers to two thrilling Super Bowl appearances, but only four winning seasons in 21 years, and none since 2003. Thousands upon thousands of St. Louis Rams fans are disappointed about losing their team. It means 10 events each year that the restaurants and hotels now lose. A sense of civic pride is lost now that St. Louis is no longer an NFL city. The bright side is it’s easier than ever to still follow the Rams — on DirecTV, Red Zone Channel, your favorite sports bar, and online streams in the near future. St. Louisans no longer will be saddled with lousy Rams games on TV and will get three televised network games each Sunday. And the Rams saved the city and state from spending hundreds of millions of dollars that could be better spent elsewhere.